June! School is out, summer is here. Time to set my One Monthly Goal hosted by Elm Street Quilts. "Any goal that involves a step in the process of making with thread, fabric or yarn is a valid goal." I debated a bit about this goal because I have two projects I was considering. One of them is a true UFO, and the other is one that I have just started and really want to keep working on. In the end I have decided to try and push myself to get an oh-so-close finish done and leave the new project for July. This is more appropriate anyway due to the fact that the new project is for a QAL that starts next month! June One Monthly Goal: Finish three snail blocks for the Garden Snail Quilt. I am SO close to being done. 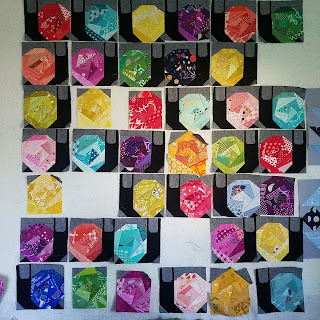 Just three more full blocks to sew and a few to "finish" once I decide which way they will be facing in the quilt. Wish me luck! 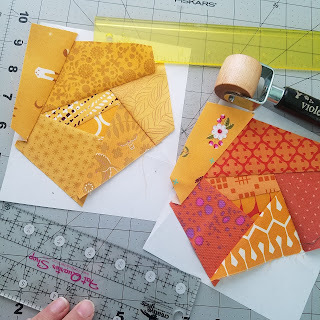 linking up with Elm Street Quilts One Monthly Goal June Linkup. I do wish you luck. This will be a lovely quilt. Sometimes I wonder if it is best to push ahead on projects we are less interested in or just go for the ones we are excited about. Either way, we are getting the quilt therapy we need. Maybe you will surprise yourself and get both finished. I'll be cheering you on! These are such fun blocks! Thanks for linking up with Elm Street Quilts One Monthly Goal and good luck with your project.